GRAINGER, sponsor of TFM‘s 2006 Facility Executive of the Year Award, recently announced the addition of more than 39,000 products to its new catalog (launching April 3, 2006). The expansion brings the number of products offered through its catalog from 82,000 to more than 115,000. 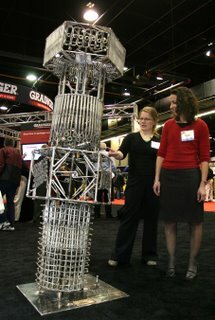 Make sure to check out Grainger’s offerings at The TFM Show, April 10-12, at the Navy Pier in Chicago. The expanded offering consists of some 30,000 different fasteners such as screws, bolts, and nuts, and an additional 10,000 products spread across diverse product categories including electrical, cleaning, material handling, plumbing and ventilation. To celebrate the announcement the company commissioned a large fastener sculpture by well-known Chicago sculptor Erik Blome. The sculpture stands 7 feet tall, weighs approximately 500 pounds, and is comprised of thousands of fasteners and related products. locally in most of its 400 U.S. branches with the balance available for shipping from distribution centers. Product selection tools will assist customers in narrowing their selection to the right product based on factors such as grade, size, and material. Advanced cross-referencing tools, a new dedicated fastener catalog and employee product training will also help customers save time in sourcing the right product for their applications. Shuttle Service For Employees: The PayoffsA look at various types of shuttles that can be offered to employees: inter-corporate campus, office to local conveniences, and public transport to office. Previous articleFriday Funny: Breaking the glass ceiling…in the men's room!